The Mobile Pack is a 10 amp power supply with a speakers and a 7Ah battery backup. The top of the housing there is a frame for mobile transceiver (175x255x235mm). The radio unit will inserted here and fixed to the sides. An additional Front panel is included. Under the radio is a PSU with 10A. Simultaneously, the AC adapter charges the built-in backup battery. If the power supply fails (power failure, etc. )jumps to the battery and the radio will continue to be supplied with 12 volts. Also a speaker for direct connection to the radio is included in the housing. 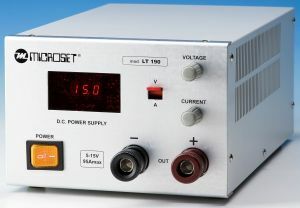 With the LT-190 is now a high-performance power supply from Microset available. The highlight of this power supply is that in addition to the voltage also the current is adjustable. A large LC Display shows the voltage and current(switchable). This power supply provides the power for the radio and all the accessories alone and you will need no more power supply at the same time. Lightweight and compact, for radio purposes, adjustable 4-15V or with fixed output 13,5V / 25A, ripple 20mV. Contain a temperature controlled fan and overtemp protection. The PTS-124 is a feature and price reduced version of the PCS-125, where also filtering of the output was changed. When operating this p/s in immediate vicinity of a shortwave wire antenna some noise might be experienced, especially on the low bands. When using this p/s with a coax fed antenna on the roof or with VHF/UHF equipment these issues will not be seen.